Washington, D.C. – An investigation by a New York Times affiliate has revealed that billionaire globalist financier George Soros, who recently called Donald Trump a “would-be dictator” during an interview at Davos, and whose Open Society Foundation works to finance and forward progressive causes across the world, and is intimately connected to numerous color revolutions, the Arab Spring, and various other political uprisings across the globe, has been revealed to be connected to more than 50 of the groups that organized the nationwide “Women’s Marches” that saw millions of Americans take to the streets across the country. The march’s official website says, “We stand together, recognizing that defending the most marginalized among us is defending all of us.” Many people turned out to be a manifestation of that ideal, but it’s important to understand the reality of what is happening on a strategic political level as an inorganic politically contrived and funded event. This, in no way, takes away from the validity of standing up for women’s issues but is important to note that women are being used as pawns in a larger ideological political game that has international overtones of power politics. Nomani reveals that the “Women’s Marches” were actually organized as political tools to be used to strategically forward a progressive political agenda against President Donald Trump — exposing the protests to largely be an organized, top-down driven political operation — and not an organic movement of concerned Americans taking to the streets as reported by the mainstream media. Much like post-election protests, which included a sign, “Kill Trump,” were not “spontaneous,” as reported by some media outlets, the “Women’s March” is an extension of strategic identity politics that has so fractured America today, from campuses to communities. On the left or the right, it’s wrong. But, with the inauguration, we know the politics. With the march, “women” have been appropriated for a clearly anti-Trump day. When I shared my thoughts with her, my yoga studio owner said it was “sad” the march’s organizers masked their politics. “I want love for everyone,” she said. The way Soros operates is as an “ideological philanthropist,” whose Open Society Foundation provides funding for organizations whose interests align with his own, and which blurs the line between political advocacy and social justice – thus being able to leverage selected/funded social justice organizations to affect political discourse. Anyone familiar with the history of the Soros Open Society Foundations in Eastern Europe and around the world since the late 1980’s, will know that his supposedly philanthropic “democracy-building” projects in Poland, Russia, or Ukraine in the 1990’s allowed Soros the businessman to literally plunder the former communist countries’ wealth, according to the New Eastern Outlook. Did Americans meddle in the internal affairs of Ukraine? Yes. The American agents of influence would prefer different language to describe their activities — democratic assistance, democracy promotion, civil society support, etc. — but their work, however labeled, seeks to influence political change in Ukraine. Additionally, during the 2016 presidential cycle, Soros committed $25 million dollars to the 2016 campaign of Hillary Clinton. Per the standard Clinton operating procedure, this was indicative of the symbiotic relationship of favors between the billionaire and his array of political puppets across the globe. Soros has often been accused of using his wealth to attempt to socially engineer the national domestic politics of entire states. He was accused of being connected to organizations that organized and funded the nationwide protests after the election of Donald Trump — a claim that Soros denies. Make no mistake that the events you’re seeing transpire nationwide are largely being coordinated, in part, by a billionaire political elite class that is looking to strategically forward a political agenda. 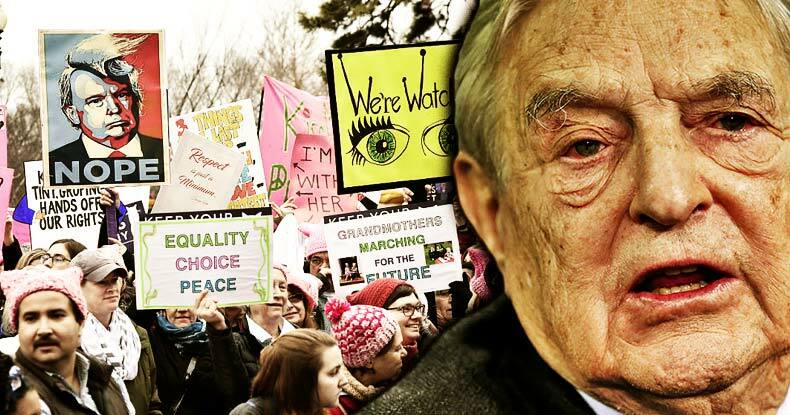 Soros has used the same formula to foment domestic unrest to affect political goals in numerous nations –and it certainly looks as if he now has the United States in his sights. It’s clear that Saul Alinsky’s Rules for Radicals is being employed by the left in an effort to destabilize and undermine political discourse in the U.S.
Women’s rights are unquestionably a human rights issues, not a political issue, which makes it disappointing that we, as free individuals, don’t organically create manifestations like these large-scale marches, without oligarchs and their vested political interests essentially making it happen as a means of forwarding their particular ideologically driven political agenda.